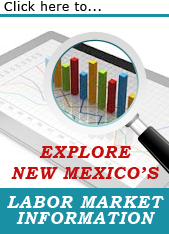 The New Mexico Department of Workforce Solutions (NMDWS) website is provided in English. However, the “Google Translate” option may assist you in reading it in other languages. Google Translate cannot translate all types of documents, and it may not give you an exact translation all the time. Anyone relying on information obtained from Google Translate does so at his or her own risk. NMDWS does not make any promises, assurances, or guarantees as to the accuracy of the translations provided. The State of New Mexico, its officers, employees, and/or agents shall not be liable for damages or losses of any kind arising out of, or in connection with, the use or performance of such information, including but not limited to, damages or losses caused by reliance upon the accuracy of any such information, or damages incurred from the viewing, distributing, or copying of such materials.